The 2014 Ford Transit Connect Wagon was delivered to my house with “#Unminivan” sprawled across the sides and back, but while this funky little European convert doesn’t feel look the part of a traditional American minivan – it offers all of the functionality of a proper minivan and the pleasant driving characteristics of a small sedan. The minivan has garnered a negative reputation in the United States similar to that of the old station wagon, with only “soccer moms” who care about nothing but getting her 4 rambunctious children from point a to point b so with the Transit Connect, Ford is working to avoid being grouped in with the rest of the shrinking minivan segment. To drive that point home, Ford has gone so far as to come up with the “Unminivan” marketing campaign even though the 2014 Transit Connect Wagon even though the features and capabilities of this uniquely designed vehicle would cater to the same types of people who need a minivan. Ultimately, the 2014 Ford Transit Connect Wagon is closer to a minivan than it is any other segment in America, but I don’t mean that as a slight. In fact, the angular little people mover really does a beautiful job of fulfilling all of the positive attributes that a minivan brings to the table while also avoiding the downsides of the minivan – including the unsavory stigma. The Transit Connect basically introduced this smaller-than-a-minivan segment when it hit the US for the 2010 model year and for 2014, the Transit Connect that got a refresh that improved an already very good vehicle. 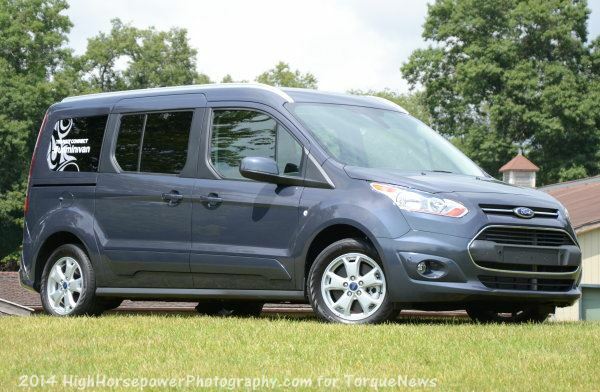 My 2014 Ford Transit Connect Wagon came with the top of the line Titanium trim package, which gives it a base price of $29,000 and a longer standard form with seating for seven. Add to that base price the $1,295 panoramic glass roof, the $300 Quickclear windshield defrosting system, the $840 MyFord Touch system with a rearview camera, the $345 remote start system, the $495 front and rear sensing systems, the $45 daytime running lights and the $995 destination fee and you have heavily loaded price-as-tested of $33,315. The exterior design of the 2014 Ford Transit Connect Wagon is the main feature that sets it apart from the minivan world, as it clearly doesn’t look like any other minivan on the market today. Unlike the relatively high riding minivans that have a fairly large footprint on the road, the Transit Connect has a much smaller look and feel to it around the outside. This smallish exterior design yields not only a unique look, but it also helps to create a very unminivan-like driving feel that I will get into later in this review. Like all Titanium models, my test vehicle featured the 7 passenger configuration and that means that it came with the longer wheelbase, but it is still a relative small vehicle when compared with the full blown minivans on sale today. The Ford Transit Connect was refreshed for 2014 and that includes a substantial facelift for the exterior that helps it fit in more closely with the rest of the current North American Ford vehicle lineup. This includes a very Fusion-like front end with elongated headlights that stretch back towards the windshield, starting on either side of a small upper grille opening. Below that is a massive grille opening flanked by fog lights and joined by an angular front fascia that gives the Transit Connect a sporty feel similar to that on the Fusion, Fiesta and the rest of the current lineup that shares the “Kinetic Design Language”. Along the sides, the 2014 Transit Connect has a long wheelbase that allows for two large front doors and two large sliding side doors, all of which allow for easy loading and unloading of both people and large cargo. The side view presents a far more slippery looking vehicle that the previous version with a much flatter form and a long, low roofline that improves aerodynamics while also looking much less commercial grade than the past models. Out back, you find the biggest functional difference with the 2014 exterior refresh, as the dual swing-open doors of the older models have been replaced with one large lift gate that opens to reveal a gigantic cargo opening. While I understand that the lift gate might present some issues for shorter drivers, I prefer the lift gate over the double doors and I love the large loading space created by this new door setup. Also, the low riding stature of the 2014 Transit Connect allows for easier loading into that big opening. The exterior redesign for the 2014 Ford Transit Connect Wagon is a great move in the right direction, as this Unminivan looks less like the commercial van that was the original American Transit Connect. The new shape with a steeper windshield, a lower roofline, large side sliding doors and a massive rear lift gate are wonderfully functional, yet the vehicle is just plain better looking than the outgoing models. While the 2014 Ford Transit Connect Wagon is billed by the Motor Company as the Unminivan, the interior space does everything that a minivan can do, and the Transit Connect does it all very well. First, the low ride height provides easier in and out access for passengers and cargo so those folks who don’t like the feeling of climbing up into their minivan will likely love getting in and out of the Transit Connect. That low ride height also affords the Transit Connect a very low floor which, when combined with the long, high roofline allows for a generous amount of passenger space in the front and middle row of seats. While the third row of seats are going to be far more comfortable for smaller children, the front seats and the middle row allow for a tremendous amount of space in every direction so even a very tall driver or passenger will find plenty of headroom, shoulder room, leg room and knee room in the Transit Connect. If you actually put seven people in the seats, things get a little friend for the middle row passengers, but that is true of literally any vehicle that is smaller than a full size conversion van so it is hardly a slight against the Transit Connect. I would go so far as to say that this little Ford will comfortably seat 4 adults and three smaller kids while still offering some space in the very back for cargo. Best of all, the front, outboard middle and rear seats all have nice plush, leather wrapped surfaces that look great and are very comfortable. My one and only complaint about the use of space in the 2014 Ford Transit Connect pertains to the rear-most seats. They fold down very easily, but as you can see in the image below, the seats are still very much in the way of loading larger cargo in the rear. You can load a ton of smaller items into the rear cargo area with the seats folded down, but you won’t be hauling any big screen TVs without unbolting the seats and removing them altogether. For a smaller vehicle, the Transit Connect Wagon offers all of the seating comforts of a minivan with slightly less cargo space – but I consider that a very fair trade when you consider the other Unminivan upsides of the fun little Ford. Ultimately, if you need space for large cargo, you are better off opting for the Transit Connect Van that focuses more on cargo and less on passenger spots. In terms of technology, my 2014 Transit Connect Wagon test vehicle was pretty much loaded to the hilt and that includes the premium MyFord Touch information system. This integrates the controls for the hands free phone system, the navigation, the climate control system and all of the features of the sound system into one easy to use panel mounted high on the dash. This system provides nice, smooth integration of those controls at your fingertips and having used MyFord Touch plenty in the past, I love this system. For those who don’t care for touch screen controls, the Transit Connect has a small panel of buttons and a singular knob mounted just below the screen along with a spread of buttons on the steering wheel that allow you to do pretty much everything that you need to do with the infotainment system without the touchscreen using the touch screen at all. You can also use voice controls, which makes things like setting the navigation while on the move a total breeze. Also, in addition to those controls mentioned above, the Transit Connect also has a driver information screen located between two large analog gauges to keep the driver well informed and a freestanding climate control panel low on the center stack. This isn’t the flashiest system on the market, but it is one of them and it is also one of my favorites. Last but certainly not least, the 2014 Transit Connect comes with an optional glass roof treatment that gives both the front and second row of passengers a clear view to the sky while a power shade helps keep the heat down on hot, sunny days. Ford might not want to call the 2014 Transit Connect a minivan, but the fact of the matter is that it does everything that a minivan does just as well as the competitors in the full blown minivan segment. While the cargo space is a little lighter, the passenger space and infotainment goodies rival the best of the minivan segment – all in a smaller package that doesn’t look like a minivan. The 2014 Ford Transit Connect Titanium Wagon comes only with a 2.5L 4-cylinder engine and a 6-speed automatic transmission, sending 169 horsepower and 171lb-ft of torque to the front wheels. This makes the Transit Connect surprisingly peppy around town, so unlike some 4-cylinder minivans that are simply too heavy for their drivetrain, the Transit Connect’s standard engine does a great job of motivating the spacious people mover. Also, with fuel economy ratings of 20 miles per gallon around town, 28mpg on the highway and 23 combined, it is more efficient than many of the true minivans on the market today. I was able to exceed the expected numbers, averaging right around 24mpg, although I had about a 60/40 highway bias while driving it so I expect that the average driver in a similar driving landscape will get similar – if not better fuel economy. After all, I do have a heavy right foot. What I liked the most about driving the 2014 Ford Transit Connect Wagon was that whether driving around town or on the highway, it doesn’t feel like a minivan. A minivan gives you a kind of high seating position that makes you feel like you are in a larger vehicle while the Transit Connect has you much lower to the ground, for a much more sedan like feel. Also, the simple fact that the Transit Connect is smaller than minivans prevents the little Ford from feeling like it is lumbering down the highway or brushing back pedestrians when driving around a tight city landscape. I would go so far as to say that if you could have someone drive the Transit Connect without being able to see that it was a 7 passenger vehicle, they would guess that they were driving a smaller sedan or hatchback. I have met many people who didn’t get a minivan because they didn’t like how big it felt on the road and in that regard, the Transit Connect blows away the minivan competition. In much the same way that the 2014 Transit Connect conducts itself like a small sedan on the road, it offers a very car-like ride quality that I find to be very nice. On both the rough Detroit highways and the unpaved roads of Oakland County, the suspension of the Transit Connect did a great job of muting the imperfections in the road that make it that much more pleasurable to drive. If you need the spaciousness of a 7 passenger minivan, but you don’t like the way that minivans look, ride or drive – you should absolutely love the 2014 Ford Transit Connect Wagon. It offers space for four adults and three children (or 1 adult and 6 children, etc) in a smaller package that is easier on gas and much less expensive to purchase. The Transit Connect does everything that the average minivan can do, but it does so without harnessing the driver with the downsides of the minivan segment so anyone who needs a good people mover with a plush interior, a high tech infotainment system and a shockingly low price – the Transit Connect is the car for you. No other vehicle that I have tested offers so much space and such a comfortable ride for so many people while handling like a small sedan and for that reason, I consider the Transit Connect one of the best family vehicles on the market today. It would be nice if the Ford dealership would stock some. We have been waiting 1.5yrs to see both a Transit and Transit connect for our service fleet with no luck. Ford!!!! ........ you may be to late to market we can't wait for ever to see these. There were only 4 in all the GTA of Toronto to buy. The most important part of this review is the capacity of the Transit Connect. ALL of the 2nd and 3rd row seats fold flat to make a flat load floor. This van can haul a 80" full length sofa! I cant believe for such a detailed review you would not even bother to correctly learn how to fold the seats! In any case nice review otherwise. This is a great vehicle that and anyone who spends a few minutes in one driving will buy one! The other market for this vehicle is people like me who have a wheelchair-bound (but somewhat mobile) family member who needs 1) a low floor, 2) headroom and 3) a place to stow and ferry a wheelchair. Both the cars I was considering to replace our PT Cruiser (which also has those features) -- the Mazda5 and the ScionXB -- have been discontinued. This is my next best option, so I hope Ford keeps them around for awhile.